Along many new features, Spring Boot 1.2 brings Jersey support. This is great step to attract those developers who like the standard approach as they can now build RESTful APIs using JAX-RS specification and easily deploy it to Tomcat or any other Spring’s Boot supported container. Jersey with Spring platform can play an important role in the development of mico services. 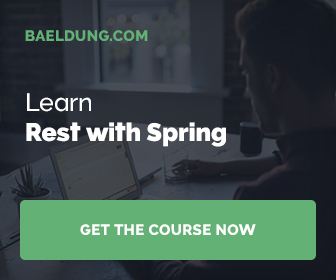 In this article I will demonstrate how one can quickly build an application using Spring Boot (including: Spring Data, Spring Test, Spring Security) and Jersey. The application is a regular Spring Boot application and it uses Gradle and its latest 2.2 release. Gradle is less verbose than Maven and it is especially great for Spring Boot applications. Gradle can be downloaded from Gradle website: http://www.gradle.org/downloads. @SpringBootApplication annotation is a convenience annotation that is equivalent to declaring @Configuration, @EnableAutoConfiguration and @ComponentScan and it is new to Spring Boot 1.2. "status": "Jersey: Up and Running!" 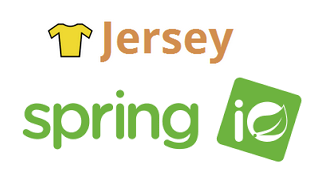 Jersey 2.x has native Spring support (jersey-spring3) and Spring Boot provides auto-configuration support for it with spring-boot-starter-jersey starter. For more details have a look atJerseyAutoConfiguration class. The JSON media type support comes with jersey-media-json-jackson dependency that registers Jackson JSON providers to be used by Jersey. Having Spring Data JPA repository in place, I created a controller (in terms of JAX-RS - resource) that allows CRUD operations on Customerobject. Note: I stick to Spring MVC naming conventions for HTTP endpoints, but feel free to call them JAX-RS way. Using @Component guarantees CustomerController is a Spring managed object. @Autowired can be easily replaced with standard javax.inject. @Inject annotation. Please note that for ease of testing the pagination with RestTemplate I created some helper classes: Page, Sort and PageAssertion. You will find them in the source code of the application in Github. With the above code I expected to have both health and spring-health endpoints available in the root context but apparently it did not work. I tried several configuration options, including setting spring.jersey.filter.order but with no success. "status":"Spring MVC: Up and Running!" In this blog post I demonstrated a simple example how to get started with Spring Boot and Jersey. Thanks to Jersey auto-configuration adding JAX-RS support to Spring application is extremely easy. In general, Spring Boot 1.2 makes building applications with Java EE easier: JTA transactions using either an Atomikos or Bitronix embedded transaction manager, JNDI Lookups for both DataSource and JMS ConnectionFactory in JEE Application Server and easier JMS configuration.